When looking at the graphical docking output (Interface score I_sc / RMSD) the values shown when hovering over the dot do not match the values on the graph itself (see screenshot, ScoreGraph.png). The lowest scoring decoy has a I_sc of ~-6 while the value shown is -4.5. The numbers of the decoy do not match either, the lowest scoring decoy from the result list is 0927 and has a I_sc of -6.228 (which would fit the graph), but on the graph the number is 0836. In another run the values and numbers matched. I am using Chrome on Windows 7, the same thing occurred with Internet Explorer. I have seen the same kind of errors in docking2 job outputs. See https://www.rosettacommons.org/node/9404#comment-8603 for details. 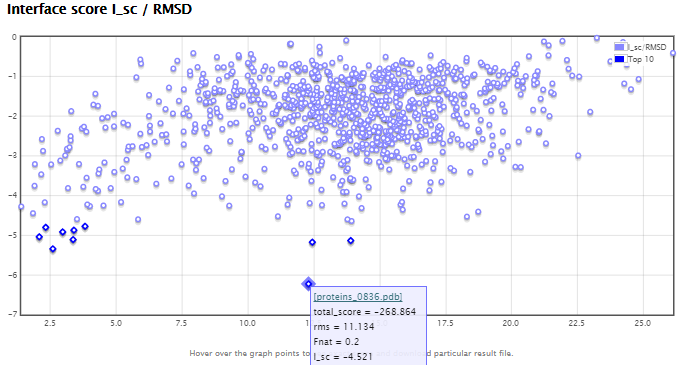 The window that pops up when you hover the cursor over a point on an I_sc/RMSD or Score/RMSD plot could also be improved. I suggest adding a blank line at the top of each window so that the cursor doesn't cover the pdb file name.